Never before in the history of art has Australian Aboriginal Art been as recognised and acclaimed world wide as it is NOW. By realising the talent of our Australian Indigenous people, not only Internationally but within Australia, there has been an explosion of genuine interest in the Aboriginal Culture, Tradition and History of one of the oldest forms of Art, following on to the search for knowledge about the people, their love of the land, the all-encompassing and intriguing stories of life and survival prior to European settlement and the integration that ensued. Aboriginal Art has paved the way for a greater understanding of the Australian way of life – created a thirst for knowledge – an appreciation of an art form with which all Australians can identify and project to the world. Our Aboriginal Artists, with no formal training, have only “just begun” to impact on the world of art with their brilliant and diversified art techniques. Following, please find examples of the sensational Art and Artists of Australia. You will find a wealth of paintings, carvings, prints, artefacts on our website when you visit our Online Gallery. 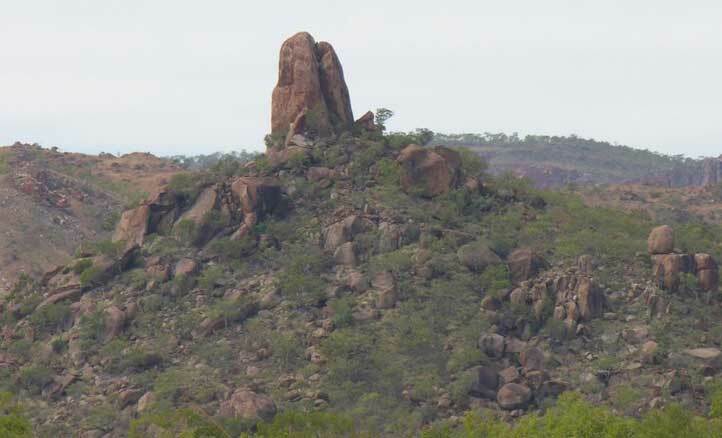 One of the oldest forms of Aboriginal Art as seen today in caves and on the sides of mountains, cleverly hidden on inaccessible ledges and huge, stony outcrops of our rugged terrain . 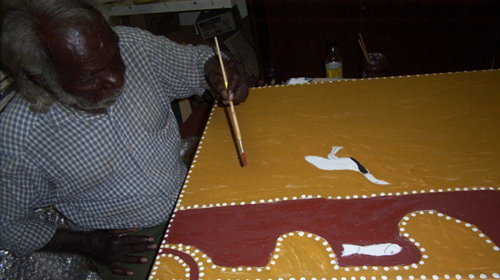 Kalumburu in the far north of the Kimberley is famous for this type of painting – the Karadada family, with Lily Karedada foremost, along with Kevin Waina, paint the images of the Wandjina and Bradshaw of their country. In the early 1970’s when Geoffery Bardon noticed the people at Papunya drawing images and stories in the sand, to the now famous style of the desert artists who use acrylic medium with incredible flair, the stories they tell of the harsh land in which they survived complement their contemporary currently famous works. 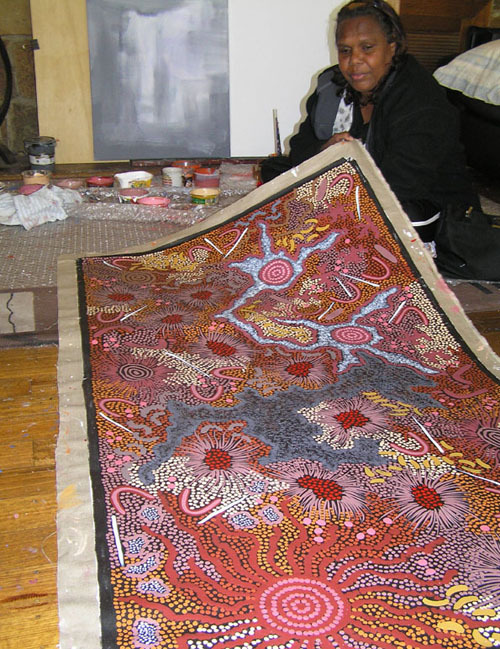 From the Jaru people of Halls Creek south to Balgo and, further down towards Alice Springs, the Walpiri people of Yuendumu, all have stories to tell through their differing art styles, much sought after and extremely popular due to the diversity of their style. 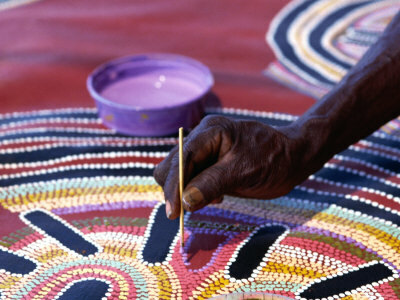 The ochre painters of the Kimberley, Western Australia, have carried on a tradition of which they are fiercely proud. The Dreaming Stories, the affiliation with their land are depicted in the medium of the ochre and natural pigments which abound in their area. The gathering and preparation of the ochre is as time consuming as the painting itself yet it is their medium! From the early 1980’s when Rover Thomas and Jack Britten were given their first canvas, which they stretched themselves onto crude “board”, mixed their ochre with kangaroo blood and tree resin, “chewed” grass to colour the ochre, and bulked it up with charcoal, a technique still used today, to the current exhibition stretchers which the next generations of ochre painters are now offered, the stories are the same, handed down from their now deceased mentors. The styles differ as always, the teaching of ochre technique, we are confident, will be carried on to infinity. Always interested in new techniques, Aboriginal Artists have in recent years embraced the art of Print making. Jack Britten, Hector Jandany, Freddie Timms, Alan and Peggy Griffiths and other artists from the Kimberley area and more recently the Desert Artists have participated in this, to them, “New Age Medium”. Possibly the first medium of Australian Aboriginal Art to come to the attention of collectors in the mid 1940’s. These works were predominantly from Arnhem Land, however, bark was used by our Aboriginal people for many reasons, in South Australia Riverland, one can clearly see the outline of a primitive canoe still imprinted in a tree trunk. We have in the Gallery exquisite works from Lily Karedada of Wandjina paintings on bark, coolamons (baby cradles, as Lil calls them), of the type in which she was carried as a “little one”, complete with bush string and carefully moulded ends made of boiled and shaped bark. 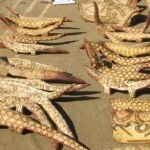 These are much sought after and rare, as the bark is best cut in the wet season, fired and shaped, then painted. Lily’s daughter, Roslyn Karadada, is carrying on the tradition taught to her by her mother, with the same precision and authenticity. 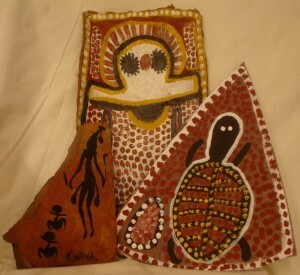 The area around Port Keats is also well known for bark paintings, and Patrick Bitting, now residing in Kununurra, offers a selection to our Gallery. 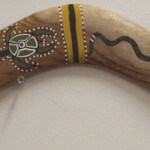 Australian Aborigines were hunter/food gatherers hence the need for boomerangs. Made from stone axes (we have these on display but not available for sale as they are Heritage Protected), they were used by the hunters for killing kangaroos and other edible native animals. The carved WOODEN COOLAMONS (unlike the baby cradles made by Lily Karadada from bark) were used in some areas by the women for food gathering. They were attached via dried animal skin and slung over the shoulder. DIGGING STICKS: Also made from wood with a pointed end were used to collect honey ants, witchetty grubs, bush potatoes (yams) etc. Food gathering was an obviously essential and time consuming duty for these people and is reflected in their paintings particularly those of the desert artists, as their land was so harsh, so dry, and food always scarce. 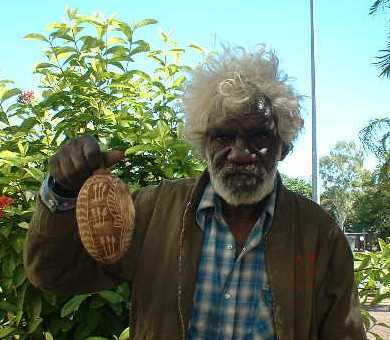 Aboriginal carvings are found in every State of Australia. Aboriginal artists have now adapted their “grass roots” tradition to translate the rock carvings to artform. 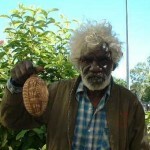 We offer amazing carved Boab Nuts for sale from the ex-stockman “Gentleman” Dusty Legune, to the professional Roslyn Karadada with her traditional Wandjina depictions, to the distinctive Aboriginal Portraits carved by her brother Rossi Karadada, the dark brown nuts from the Wyndham area and the “three -dimensional” carvings of Gordon Hall on the rock hard boabs from Glen Hill Station. SLATE CARVINGS: are also created by Roslyn – every artefact she completes is proudly signed “Roslyn Karadada” – totally professional and intensely traditional. Ros travels a long way (per favour her husband Lenny Lewis) to collect the soft slate from “my special place behind the Argyle Diamond Mine”, a huge distance from Kalumburu. She will not compromise, she works with the best material and produces only the best. These small artefacts make stunning table centrepieces, and attractive mantle shelf decorations, again showing to the world how adaptable and clever our Aboriginal people are. ABORIGINAL ART – IMPORTANT – INVESTABLE – INTRIGUING – THIS IS JUST THE BEGINNING!